From Casa Magazine published December 25th, 2015. It’s about creating a better chance for success, given that the incarceration recidivism rate in Santa Barbara County is 71 percent. The Transitions Program at Santa Barbara City College (SBCC) is tackling this challenge by changing it, one student at a time. 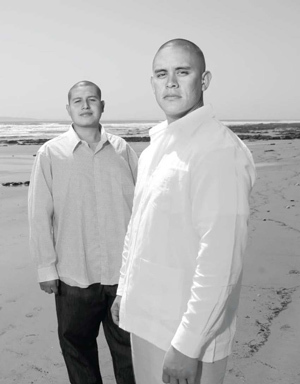 The program gives students leaving the criminal justice system the support they need to succeed at Santa Barbara City College (SBCC). These students, all of whom are on probation or parole, are taught how to navigate the campus, develop study skills, and use the resources available to them on campus. Equally important, students in the program find peer support and learn to trust in themselves and others. Sheba Lux, grant writer at SBCC, says that the program’s director, Noel Gomez, “is one of the key reasons these students show up at SBCC.” Gomez, 30, grew up in East LA’s Boyle Heights’ neighborhood at a time when it had more gang members per capita than any other place in the country. Early on, Gomez learned that an education would be the key to his future. Against the odds, Gomez managed to stay out of gangs and go on to pursue his higher education, obtaining his B.A. in Chicano Studies from UCSB and an M.A. in Education from Harvard. He returned to Santa Barbara in 2008. At the same time, Martin Leyva, the founder of the Transitions Program, was transitioning from San Quentin Prison to SBCC. Struggling with the adjustment himself, Leyva started to notice familiar faces on campus from the probation office. Wanting to reduce the feeling of isolation that he and others were experiencing, he organized a support group for people on parole at an on-campus and enlisted the help of SBCC’s office of Extended Opportunity Programs and Services (EOPS). Under the leadership of Marsha Wright, EOPS established the Transitions Program and hired Gomez to run it. “Incarceration is not working, but education is,” says Noel Gomez, Program Director for the Transitions Program. The Fund for Santa Barbara—a progressive community foundation with the motto “Change, Not Charity”—has supported the Transitions Program with grants over the past five years, most recently with a three-year grant through 2018. With the Fund’s support, the Transitions Program is creating a prison to college pipeline. Last May, the Santa Barbara County Jail made a decision to allow Gomez to begin Transitions coursework in the jail, so that college credit could be earned prior to release. ‘Inmates’ will leave the system as ‘students’—offering them a smoother transition to life and a new future. Earlier this year, the Stanford Criminal Justice Center and the Earl Warren Institute of Law published a report called Degrees of Freedom. Funded by the Ford Foundation, the report identified the Transitions Program as one of a handful of statewide model programs for expanding college opportunities for currently and formerly incarcerated Californians.